View More In Baking Tools - Page 4. Must-have cookware for the home kitchen! The Ultra Cuisine wire cooling rack was designed to double as a cooling rack AND a baking rack! 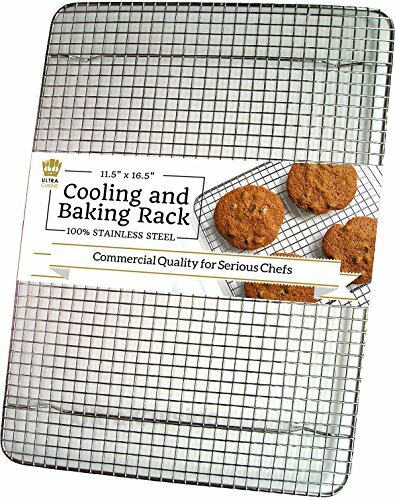 Thanks to high-grade stainless steel construction that will NOT rust & a generous size that fits into 1/2 sheet pans - this rack is as perfect for countertop cooling, as it is in a hot oven. WHAT MAKES ULTRA CUISINE THE BEST? UNIQUE SIZE: Because edges of pans taper in at the bottom, not all 12" x 17" racks fit inside. So we designed ours at 11.5"x16.5" to fit the interior of 13" x 18" pans like Nordic Ware, Wilton, Island Ware, American Bakeware, Vollrath and more half sheet pans. OVEN SAFE: to 575˚F degrees - bake, roast, cook, smoke, barbecue & grill! NON-TOXIC: No artificial coatings or cheap chrome plating that can wear off or flake in your food. OUR GUARANTEE: If the UltraCuisine rack ever breaks or rusts under normal use, we will send you a brand new one or a full refund. Choose the TOP SELLING HEAVY DUTY cooling rack by Ultra Cuisine with a reputation for quality. Ultra Cuisine is a registered trademark of authorized seller, Virtuosoul LLC. If you have any questions about this product by Ultra Cuisine, contact us by completing and submitting the form below. If you are looking for a specif part number, please include it with your message.